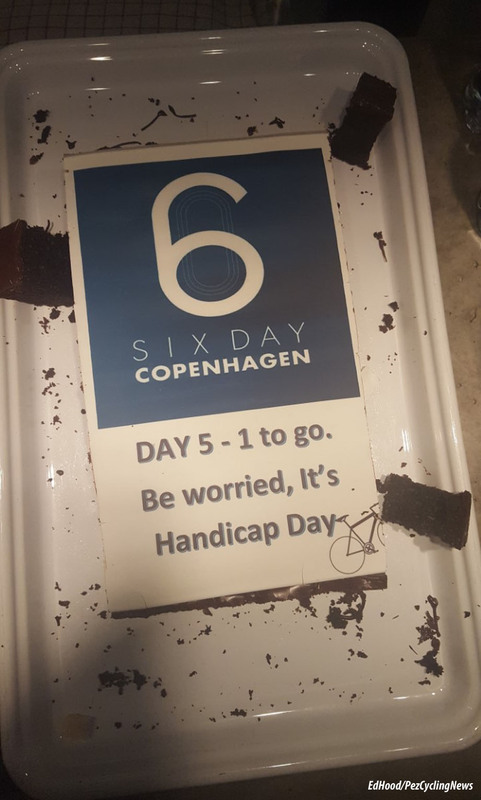 Copenhagen 6 Day: As the curtain came down on the final days of the Copenhagen 6 Days, Ed Hood was working hard bellow the boards to see out the last three days... or nights, and so the '6 Day' gerbils stop racing round in circles until next winter. Just about everyone – except us – was late to the track on Sunday afternoon, no surprise after a late Friday, early Saturday then late Saturday. There was a definite lethargic vibe in the cabins not helped by us losing Achim to a bad throat – he came in to see the doctor and organiser but looked terrible and Kris took him back to the hotel. Sunday is about the kids and there was a big crowd there with lots of mums and dads in attendance with their future Mørkøvs/Hesters/Hansens. 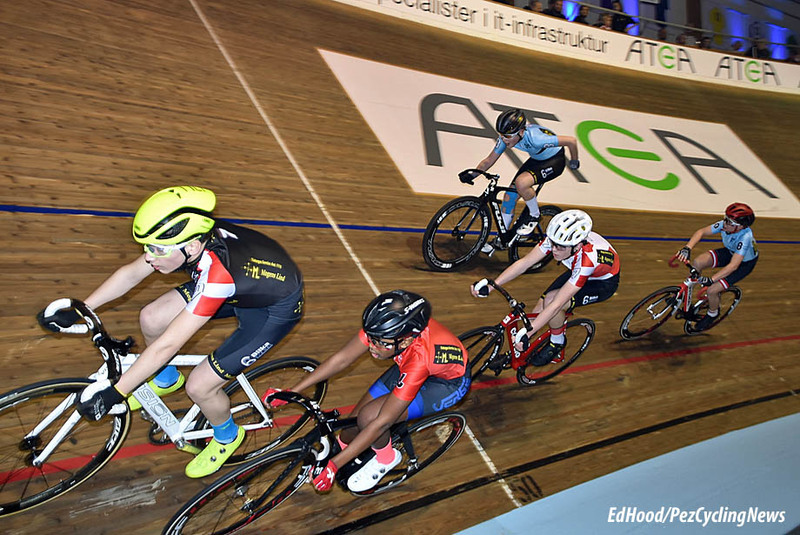 . .
As Kris pointed out to me, one of the reasons Danish track cycling is so strong – the Danes dominated the team pursuit and madison World Cups this winter – is that they start them young and give them races to ride. 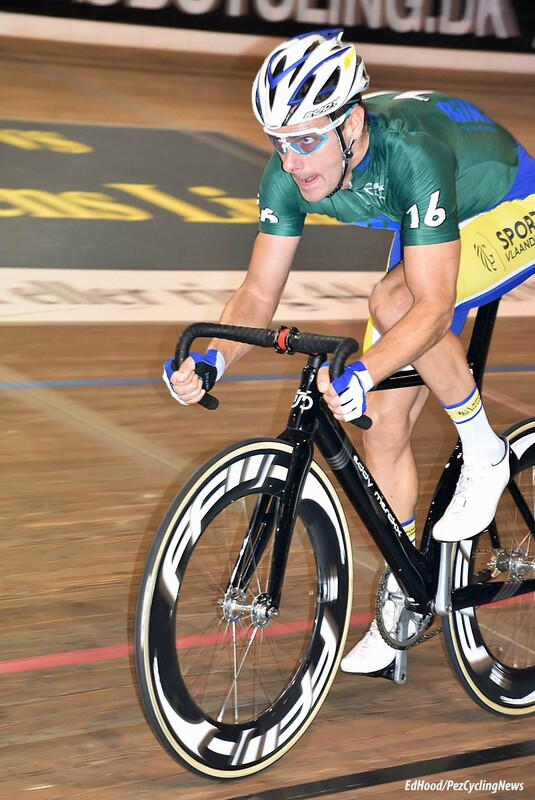 If you check the results of the ‘Mini 6’ you’ll find Jimmmi Madsen – current joint race organiser and fourth in the Danish all time six day rankings with nine wins and 43 podiums in total – way back in 1983; now retired German six day ‘Big Beast’ Robert Bengsch in 1996 and in 1998 a certain Marc Hester. 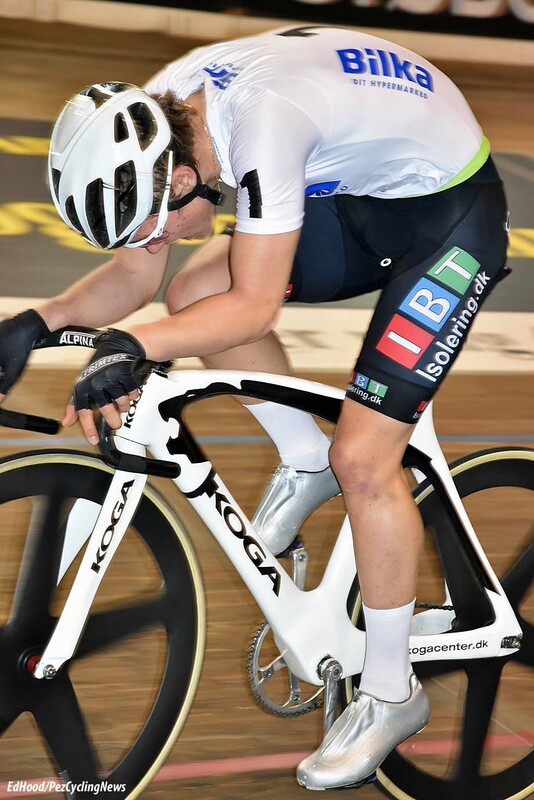 And when you check the results of the u23 race you’ll find Brian Holm, Jesper Skibby, Bo Hamburger, Alex Rasmussen, Roger Kluge, Peter Kennaugh and Lasse Norman. 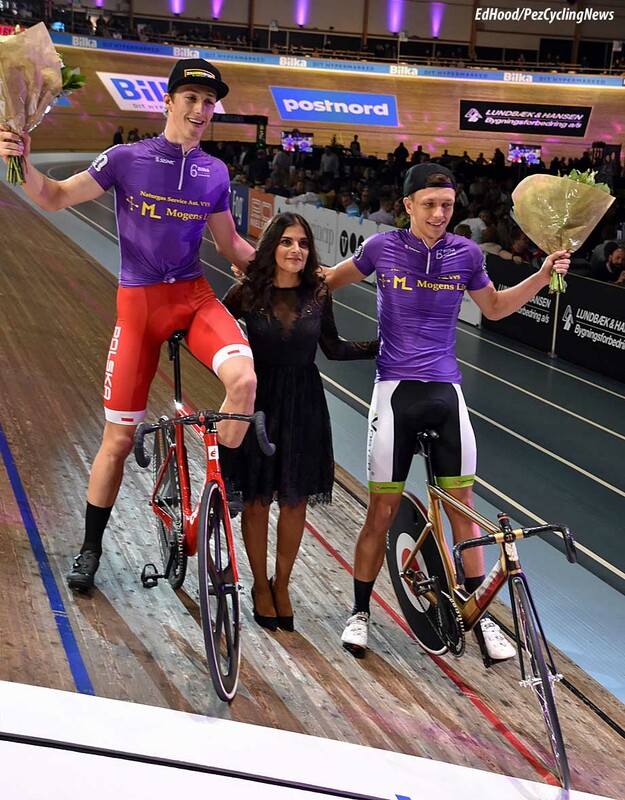 The team elimination which closed the Mini went to the splendidly named Theodor Storm and Magnus Ritz. 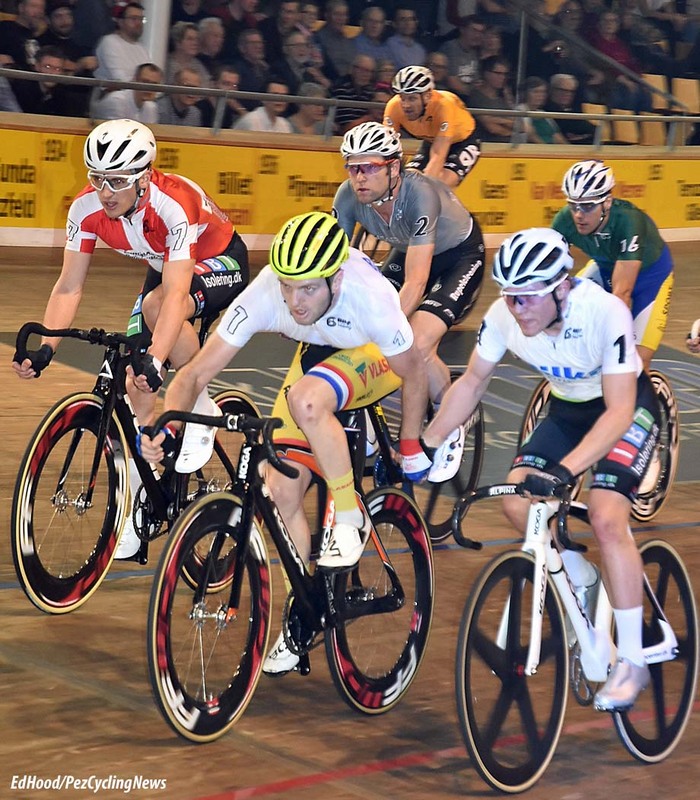 ‘Riders on the Storm’ and ‘Putting on the Ritz’ will surely be their signature tunes when they ride the Elite Six day? We had another of those daft ‘walker’ races with team seven v. team nine - but despite Hester handing over a lead to Reinardt, Wulff came back strongly to maintain ‘par # 7’ superiority. 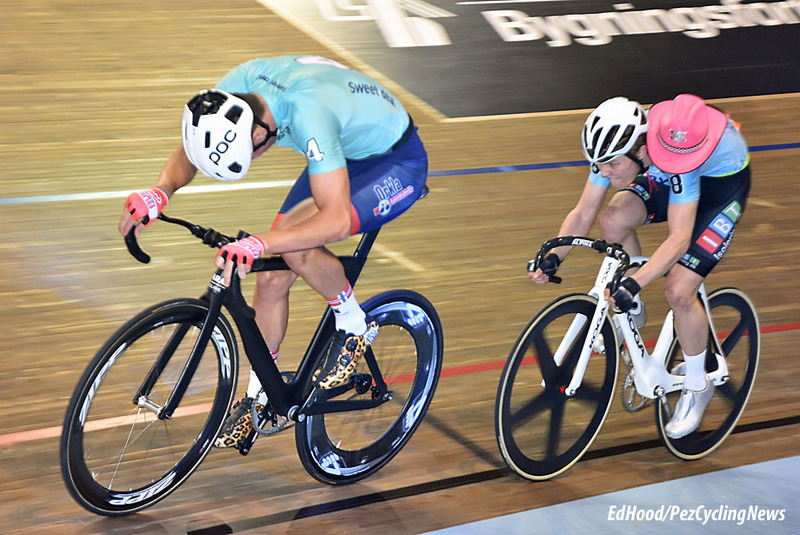 There were two Derny race and the flying lap – won by Morkov/Wulff, who else? 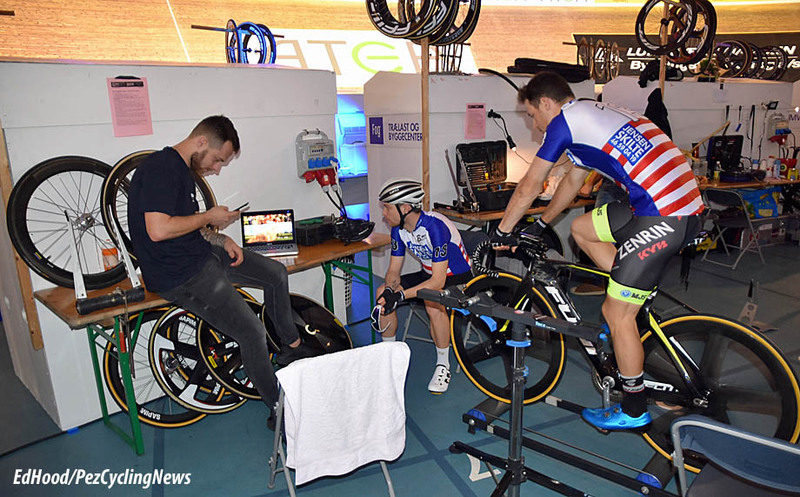 – but I must confess to spending a good chunk of the afternoon with the Kreder brothers in front of the Dutch mechanic’s laptop watching events from Bogense where a rampant Mathieu Van Der Poel emulated his father and took the world title. 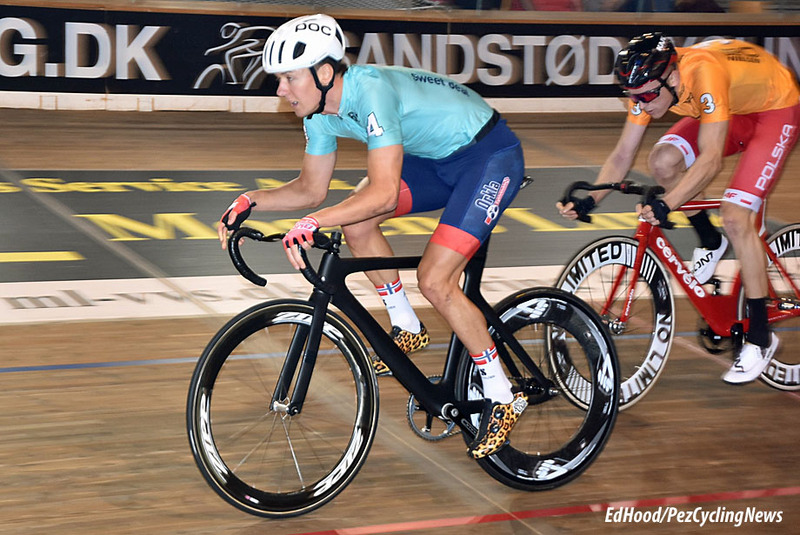 Malmberg put on his best pink cowboy hat on for the ‘Balustrade’ – and not content with leading the nonsense he went on to win the sprint at the end from Norwegian, Oddli – the man with the shoes. 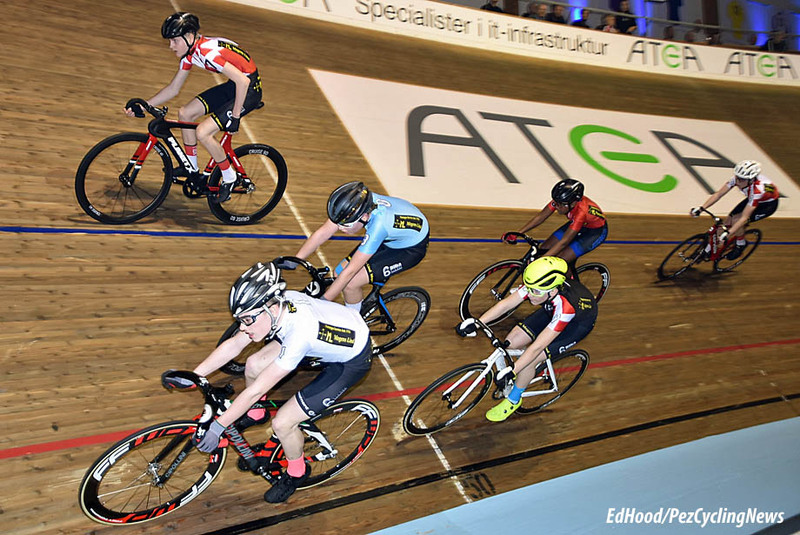 To close the afternoon there was a one hour chase – too much for a Sunday afternoon, we thought – and sure enough it was a pretty low key affair won by Jesper Mørkøv and Christian Grasmann. 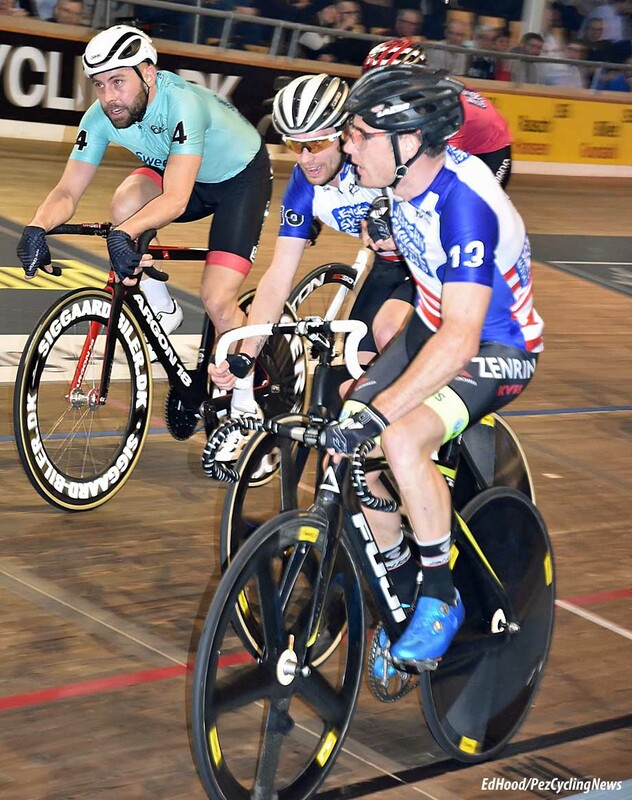 Kenny De Ketele and Moreno De Pauw lead overall but that looks set to change after Monday night’s 75 kilometre handicap madison – 300 laps. . . 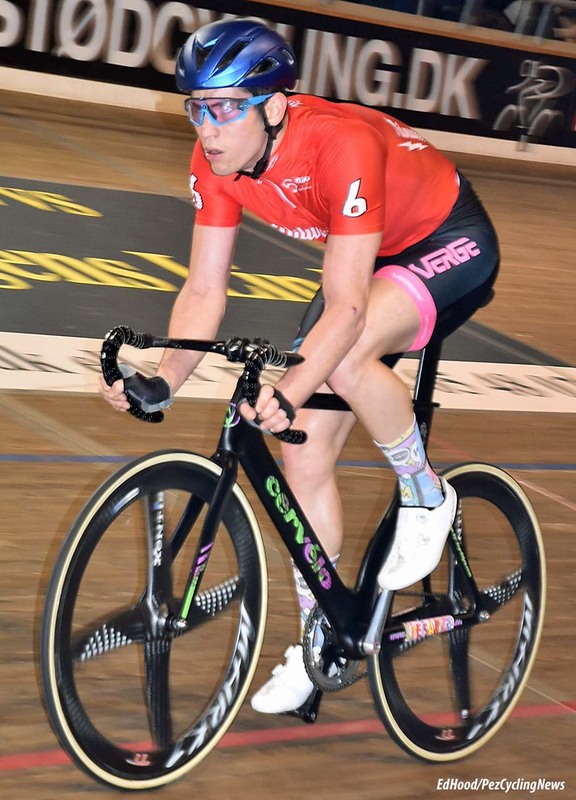 Messy; that’s the word I’d use to describe what should be the jewel in the Copenhagen Six Day crown; the Monday night 75 kilometre, 300 lap handicap madison – run this year as a memorial to recently departed Danish six day star, Gert Frank. The house was full, the vibe good and everyone was looking forward to what is usually a great race. The big teams ‘give away’ up to six laps to the minnows with final chase standings counting not just on the night but overall. 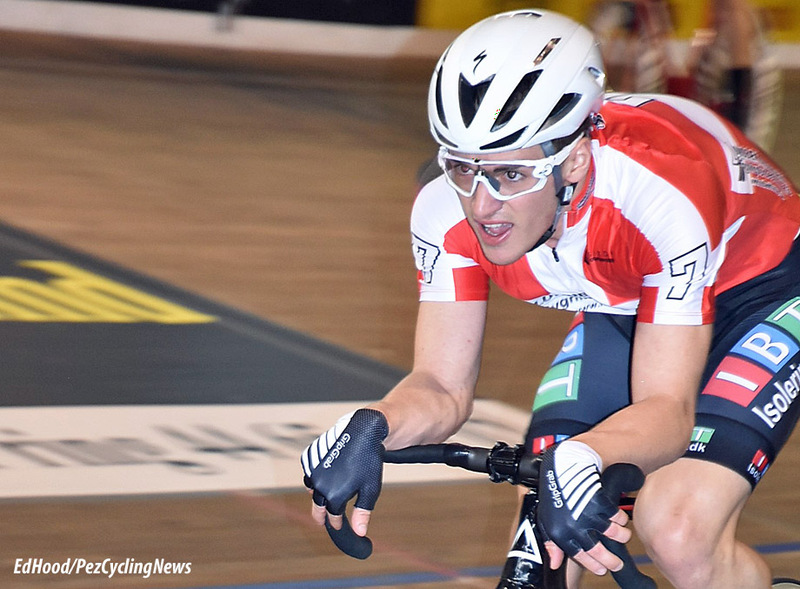 No one can mess around and Michael Mørkøv’s face as he pulled away from the start line said it all. At 225 laps to go it was still ‘limit men’ Oddli/Lander leading with Michael turbine smooth and Kenny De Ketele firing Moreno in with huge slings despite that recent collar bone breakage. 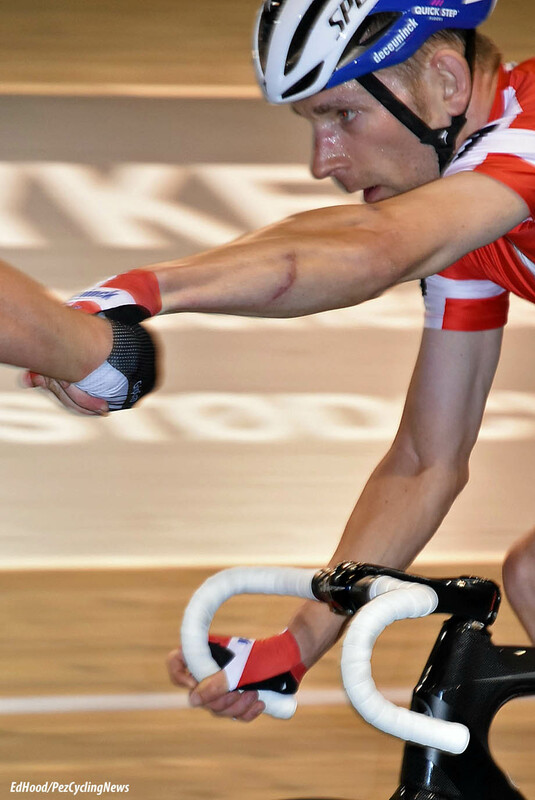 With 185 to go there was the pistol shot ‘crack’ of a tyre at very high pressure exploding; Jesper Mørkøv was on the deck with the race neutralised for the medics and track inspection – a big crash can mean splinters lifted out of the boards, not something light track tyres enjoy. Simultaneously our boy Hans came down off the track; no legs and bad breathing, perhaps the start of a virus? Whatever it was, he was out. 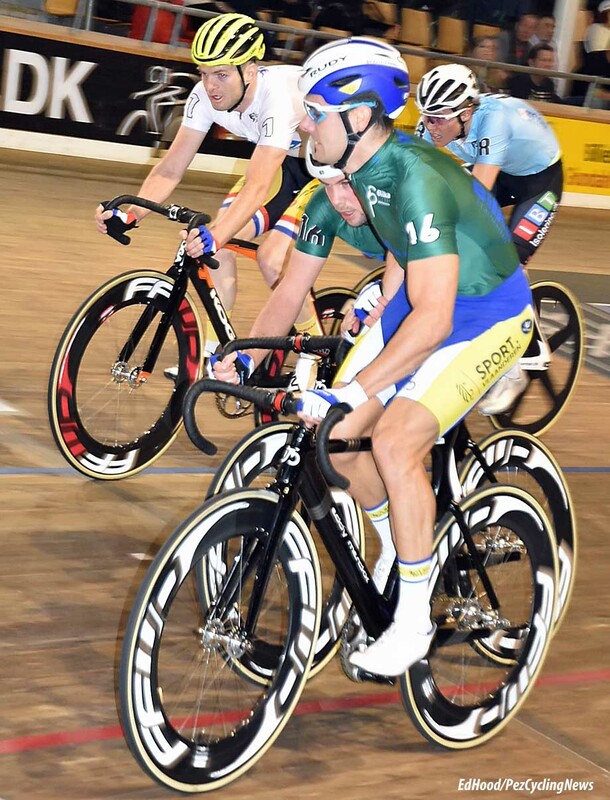 The race wasn’t long back in effect when, with 162 to go Yoeri Havik and Wim Stroetinga came down hard and there was another neutralisation. 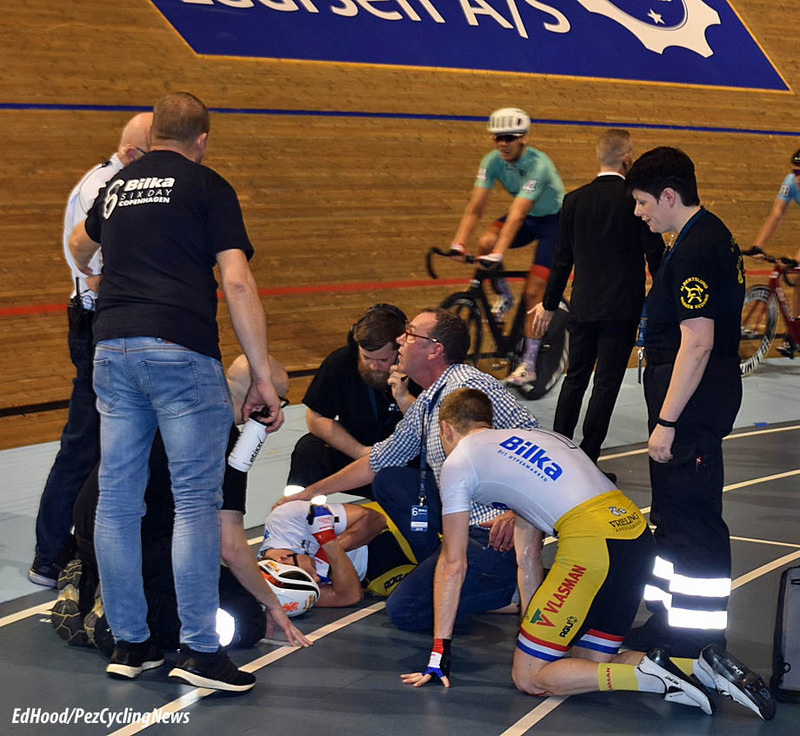 Stroetinga lay motionless on the track for what seemed like an age but we heard later from hospital that it was ‘only’ a dislocated shoulder – but concussion too, I would wager. 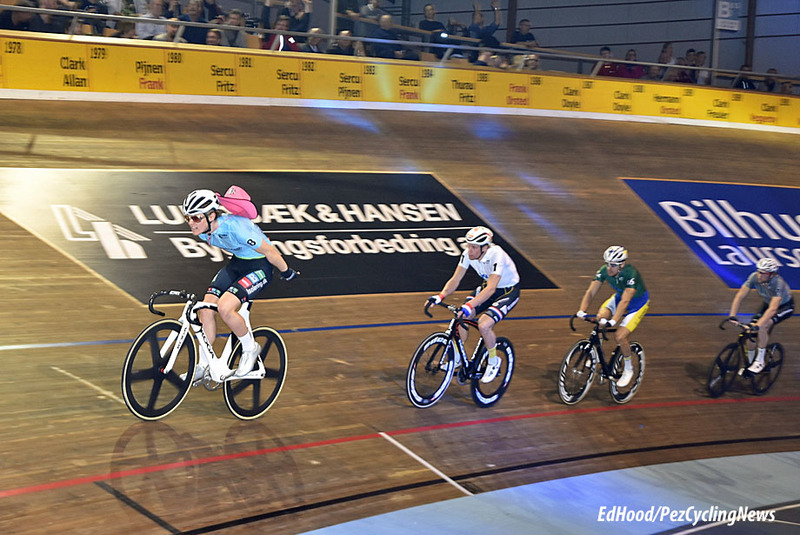 With 162 to go, Havik returned to the fray, partnering Christian Grasmann, who had been riding with Mørkøv Junior. 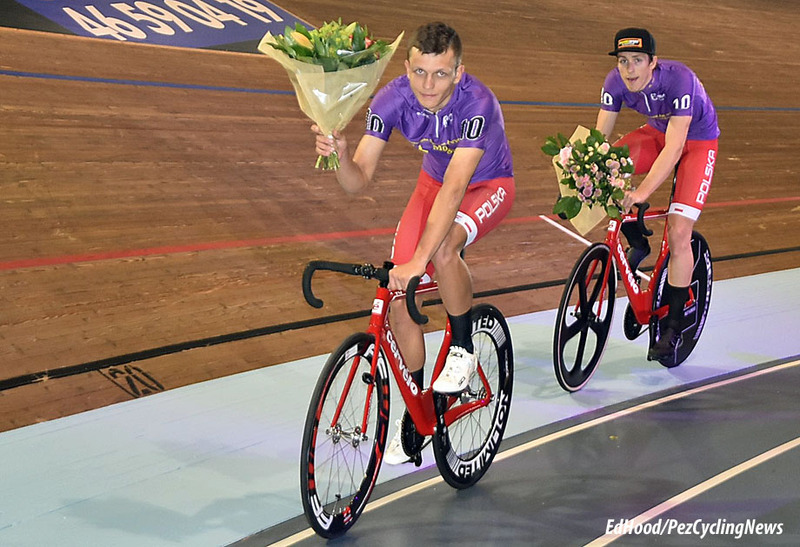 That said, the two winning Dutchmen rode a solid, professional race, closing down every move from young Danes Kron and Stokbro - who many saw as favourites for the race - and deserved their win. 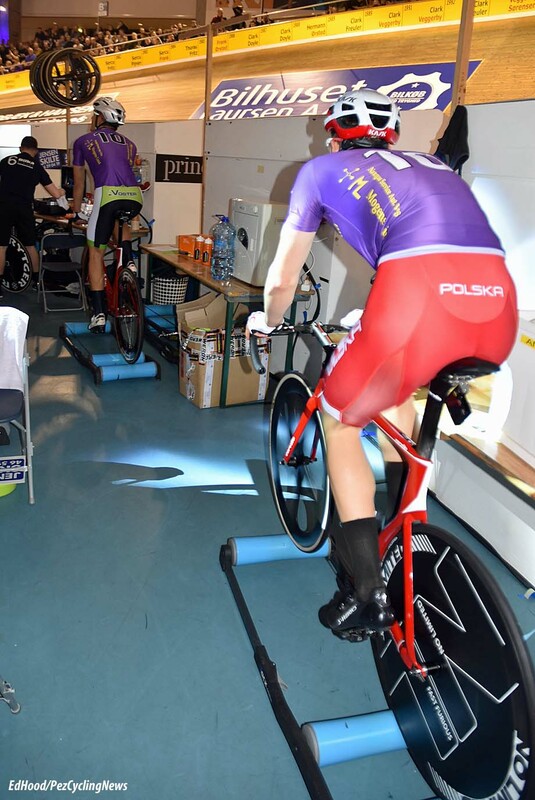 Whilst we still had Achim out with illness, the night started well for us with Bartosz and Szymon taking the one lap TT seriously, warming up properly and blasting to the fastest time of the week in 12.6 seconds. Norwegian Oddli won the longest lap and De Ketele and De Pauw won de Derny before Schmiedel won the elimination at the expense of Hans. 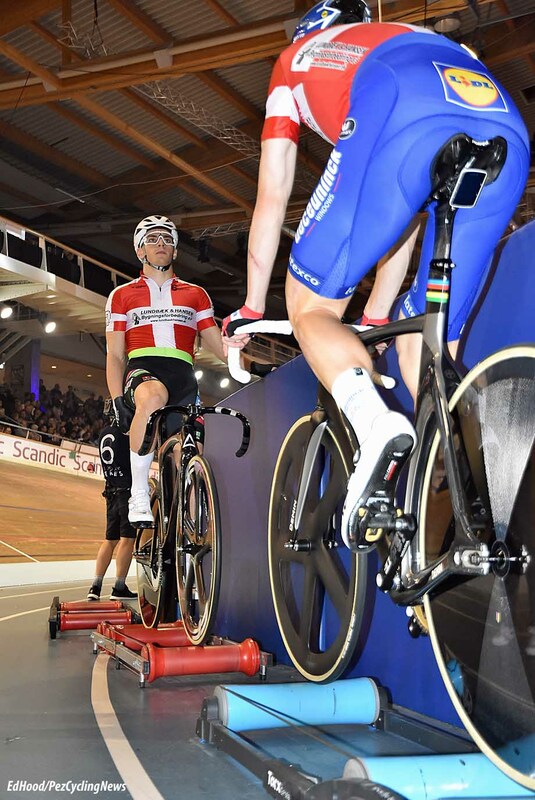 They let the Norwegian win the balustrade sprint too, which is the warm up for the chase; the riders swoop in after it for last minute use of the pee pail, a drink, a gel – or all three. Such a pity that the race went the way it did. But on the bright side – that’s the last washing done. 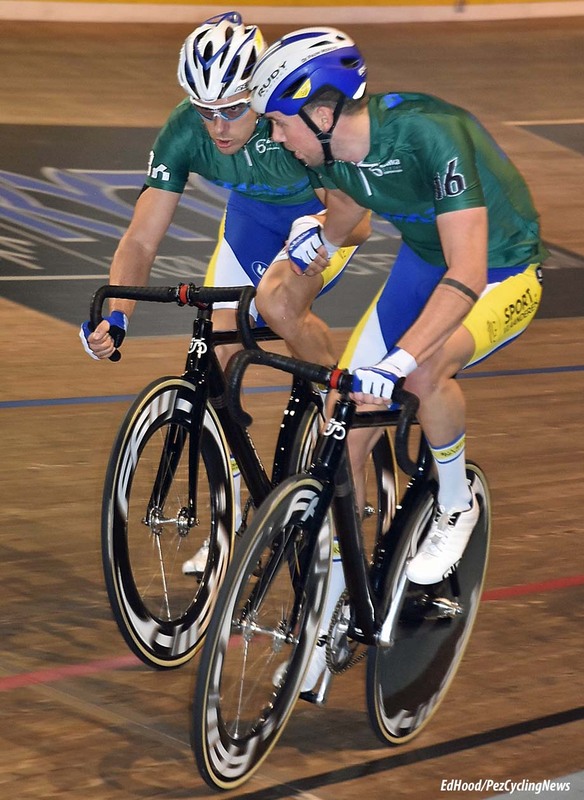 ‘Despite a huge late attack, local hero, seven times winner and now 11 times podium finisher, Michael Mørkøv and ‘Dane on the way up’ partner, Oli Wulff couldn’t take the lap which would have put them level on laps with Belgians Kenny De Ketele and Moreno De Pauw and given them the win in the Copenhagen Six day due to their superior points total. 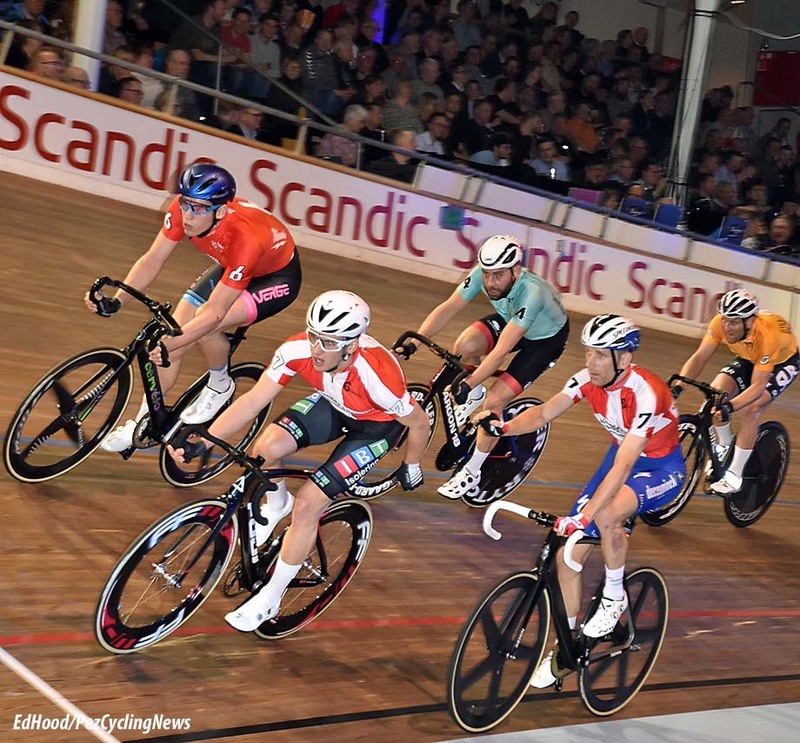 The full house crowd at Ballerup Super Arena was treated to a convincing and fast last 50 laps as De Ketele and De Pauw contained the flying Danes to win in style from Mørkøv and Wulff and experienced Dutchman, third placed Yoeri Havik and his partner Matias Malmberg, another young Dane on the way up. 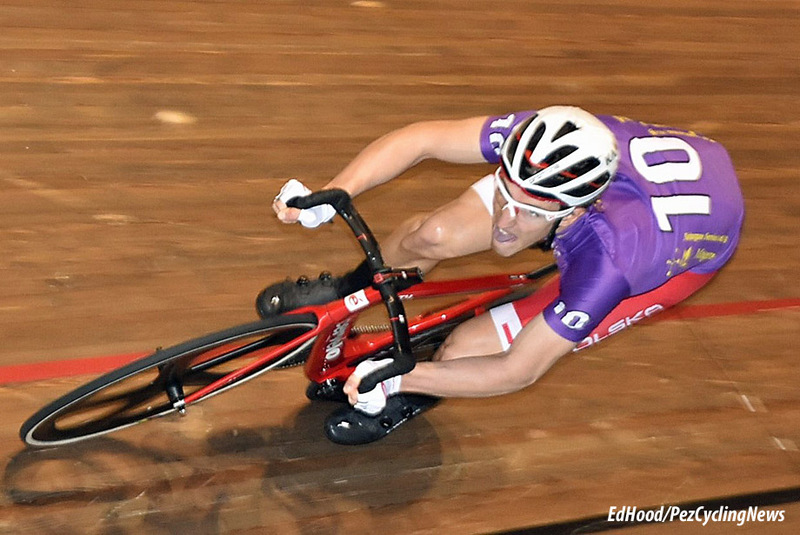 De Ketele’s win was all the more remarkable as it came just a month after he crashed out of the Rotterdam Six day. 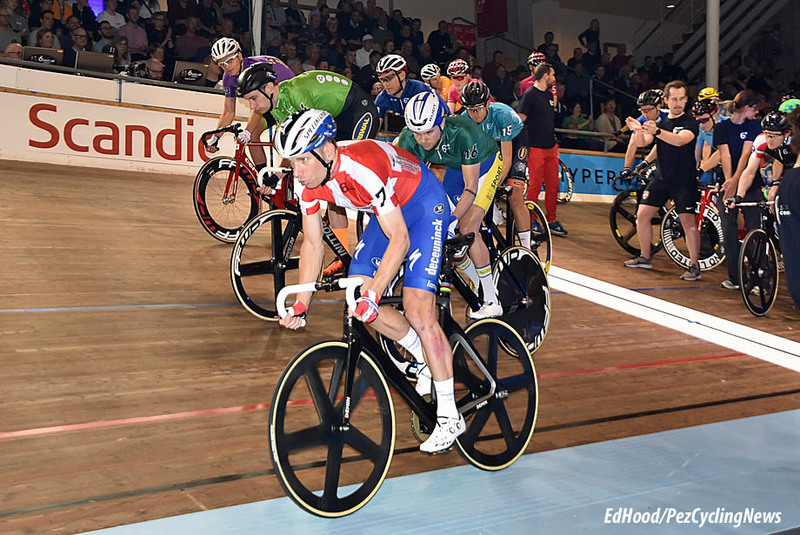 Havik too has been in the wars of late, coming down hard in an exchange with partner Wim Stroetinga in the handicap madison on Monday night - Stroetinga wasn’t able to continue and had to be taken to hospital with a dislocated shoulder. 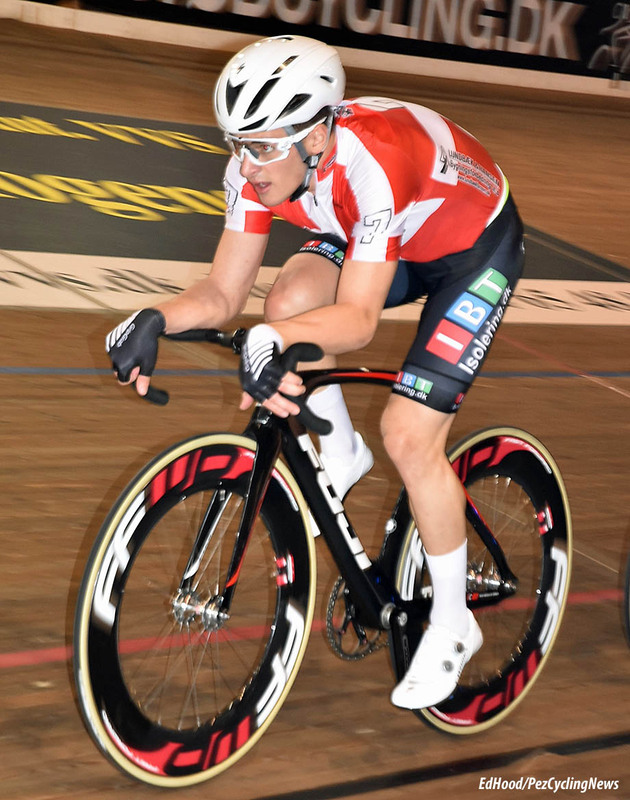 Malmberg was originally partnered with German, former European Derny Champion, Achim Burkhart who had to pull out after going down with a virus. Missing from the final reckoning was local favourite and former winner Marc Hester, his partner, world champion Theo Reinhardt having been taken ill on the eve of the last chase.’ How was that? But there’s a little bit of ‘fake news’ in there though; whilst the ‘party line’ is that Reinhardt was ‘sick’ the fact is that he fell out with organiser Jimmi Madsen and didn’t start the first or main chases of the night. The rumour mill tells me that Madsen described Reinhardt as an ‘amateur’ and ‘unworthy of the champions bands.’ No doubt there will be other versions. Hester/Reinhardt’s absence didn’t detract from the final chase but you have to feel sorry for Hester’s big local following, denied a chance to see their man in action. 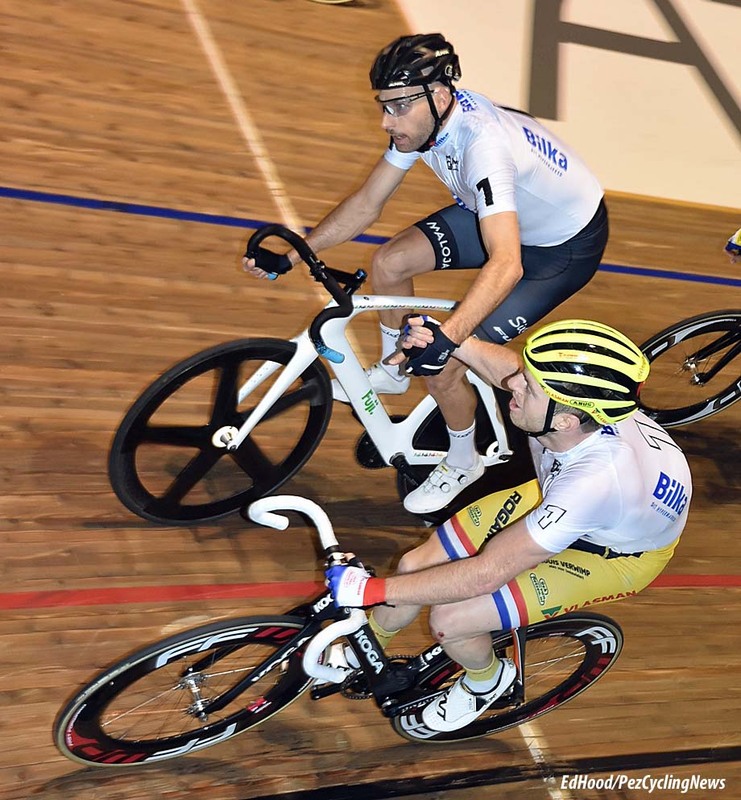 Earlier in the evening the usual six times six lap sprints kicked things off as the house filled to capacity with the track centre V.i.P. tables sold out too. 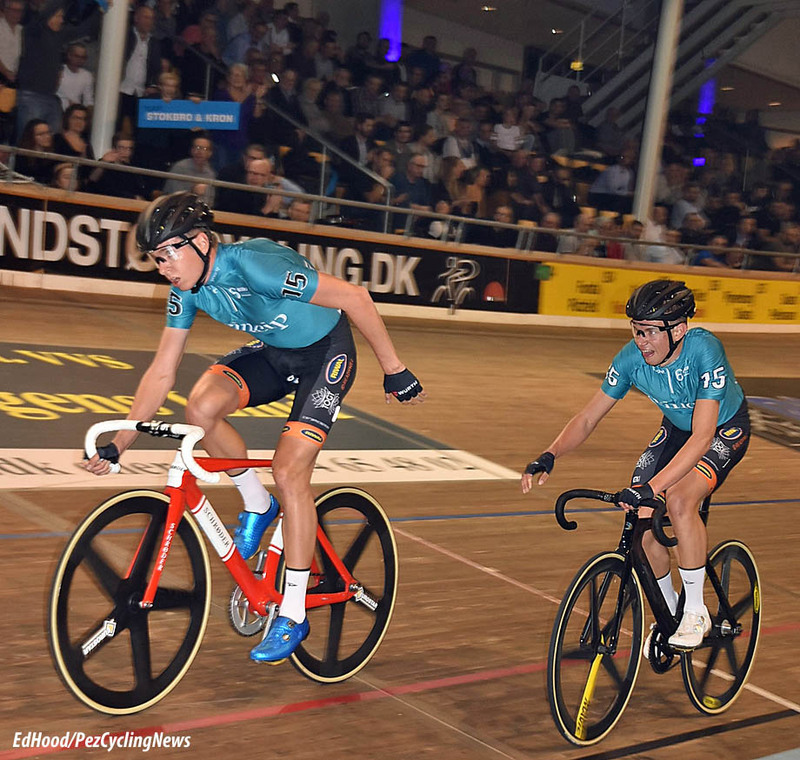 The 30 minute chase ensued, won by Mørkøv and Wulff but sans Reinhardt & Hester with puzzled looks from fellow riders as they passed by the be-curtained cabins and inert bikes of the men in black, number nine team. Pole Adrian Teklinski won the ‘longest lap’ and Havik devil number one. 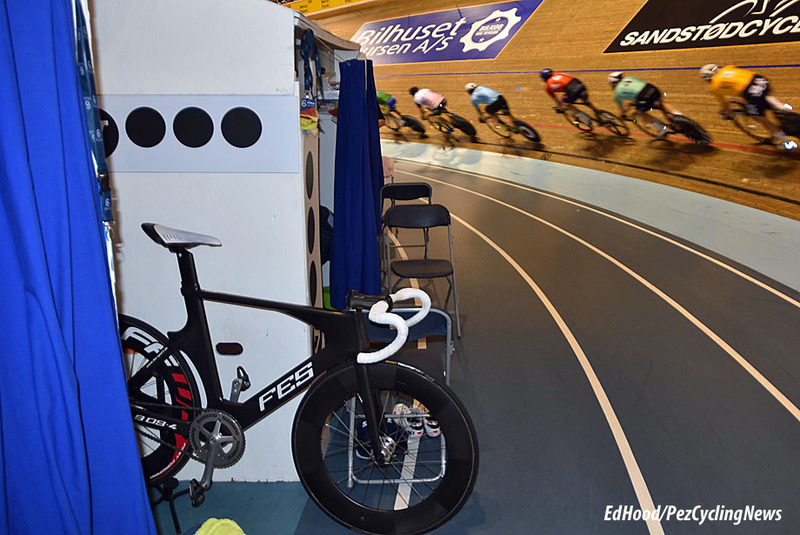 There was a ‘farewell Christian Grasmann’ ceremony – this being his last six day – but I missed it, that stuff in the track cabin doesn’t go down to the main cabin by itself. . . The Derny final was a Mørkøv v. Mørkøv affair as Yellow’s ‘The Race’ blasted from the PA; if I tell you it was the man with the matching orange shoes and socks who won then you’ll know it wasn’t Michael. Devil two went to Malcharek – I’d forgotten he was here. Our Poles blasted the one lap TT with another sizzling 12.6 ride. But I missed Dario G, ‘Sunchyme’ and the last balustrade – more bags to the cabin. Poor Achim was down there, sleeping on the massage table – that virus has hit him hard, I was back to hear for ‘Cara Mia’ for the last time until late some Saturday night when I’ve had too many grappas and dial it up on the laptop. As I said above, the fans may have been disappointed that local hero Michael Mørkøv didn’t win but the conclusion of the chase saw some good racing and few would think they didn’t get value for money from a last night programme which zipped along. Michael and Oli. to win in 2020? That would be nice but training for those pesky Olympics might just get in the way. . .